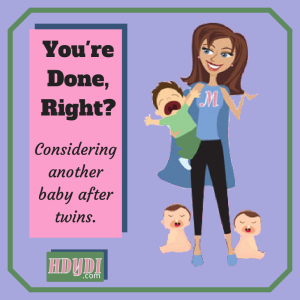 Twinfant Tuesday: "You're done, right?" | How Do You Do It? Of course, this decision is completely individualized per family and not one you can give advice on. I’ve debated whether or not to post about this on HDYDI, since some friends and family periodically read this. But, screw it. This is honestly what’s on my mind. And I’m curious how others answered this question for themselves. Of course, many people have made the cliché comment: “You had a boy/girl set of twins. Instant family! You’re done, right?” It’s been amusing to see how many people feel comfortable commenting on our family size. I can’t seem to remember what our expectations around family size were before infertility and having twins. The expectations apparently flew out the window when we had a hard time conceiving on our own and had twins. I try to stay as mindful as possible with my almost 10-month twins during the waking hours and set all of this aside. I snap a gazillion photos. I giggle along with them, as they tackle each other and belly laugh. I close my eyes and take a deep breath when they snuggle with me to steal a sniff of their baby smell. But, when these little loves go to sleep, this question often crosses my mind. I make mental pros/cons lists. I say a little prayer of gratitude that infertility treatments left us in a place of being able to consider having more, while also wondering if we’d be “done,” like so many seem to want us to be, if we’d conceived twins on our own. Even though friends with singletons think we’re nuts to think about more, especially when our twins are ten months old, I do feel a clock ticking to make this decision. 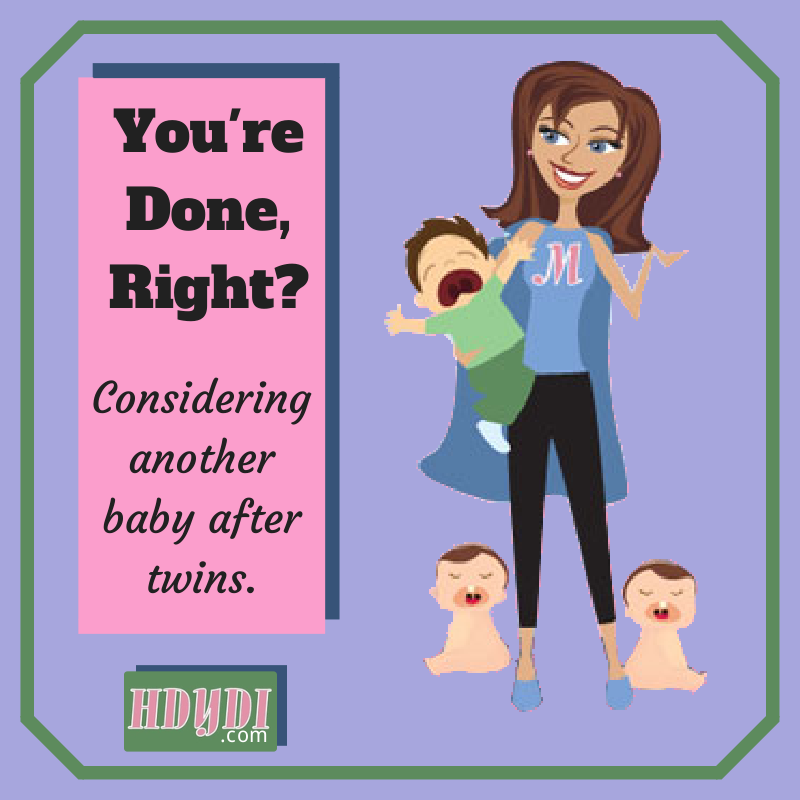 If you had twins first, what was your experience like of deciding whether or not to have more children? What factors came into play? You are NOT nuts! I have 3 myself (second pregnancy being b/g twins), and there are days I still wonder. Children are such a joy. And this baby time is so short! When out and about with the double stroller, many people will smile and comment, “How perfect! A boy and a girl. You’re done!” And then I point out their sister running along next to me, and they usually have a look of disbelief. I feel like a rockstar sometimes with all the attention, but it does annoy me that the assumption is a boy and a girl is the limit to how many children a family should have. Absolutely! I wonder if people make that comment to people who have boy/girl singletons or if they save it up for b/g twins?! I love having kids and I love being a mom despite the challenges. I still want more kids. I came from a large family (9 kids!) and I loved it. And I absolutely LOVE the sibling interaction between my three kids so far. If everything goes according to “plan” we’ll eventually have two more kids for a total of five. That’s awesome! Ours are just starting to interact more and it’s amazing to watch. Thanks for the comment! Thanks, Erica. I feel the same way-if we’d had had our b/g twins separately, we probably would’ve been done, mainly because we would have been a few years older. But part of me is not sure if I only want one pregnancy, one time going through each stage, etc. We are 98% sure we are done, we originally planned for 4, but we want to keep that option open, just in case. I honestly hate being pregnant, but I love having kids and babies. I love the way my current 3 play together, even with a 6 year or so age gap. And I love when my toddler comes up and gives me hugs and kisses for no reason at all. I love teaching them and I love being a mom. So, maybe I’m done, or maybe in 3 or 4 years I’ll be hiding a pregnancy from all those who think it is their decision how many kids we have. Pingback: The One-Year Myth - How Do You Do It?